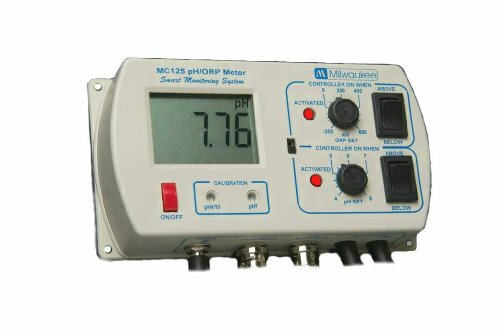 pH Controller, Range: 0.0 to 14.0, 2 point manual calibration, Accuracy of +/-0.2 pH. Set point range: 5.5 to 9.5 pH, LED visual alarm active and power plug socket for dosing turned on when reading is higher or Lower (user select) than the set point. Supplied with 12V DC power adapter, MA911B/2 double junction pH Probe, 20mL. pH 7.01 calibration solution and screwdriver for calibration. Unit comes with mounting kit and probe holder.